Dailene Barros used glasses she borrowed from Joceline Alexandra Oliveira (left) in an eighth-grade science class at North Middle School in Brockton. BROCKTON — The opening of school here in September almost had the feel of a memorial service. Teachers from across the city descended on the high school where 80 yellow ribbons had been fastened to seats throughout the auditorium. Superintendent Kathleen Smith, in a grim voice, told everyone to look to the left and to the right: Each ribbon represented a colleague whose position had been cut over the summer in a painstaking effort to plug a $16 million budget gap. Many teachers, though, needed no symbolic reminders of the departed: Years of painful cuts have left many of them with more students in their classrooms than they ever imagined, in many cases far exceeding acceptable levels in the affluent suburbs. Resources are running thin, too. Brockton was able to spend just $1.28 per student on classroom supplies during the 2016-17 school year, while Weston, one of the wealthiest towns in the state, provided $275 per student. Twenty-five years after the state enacted its landmark Education Reform Act, which pumped millions of dollars into public education, enormous funding gaps exist between poor and affluent school systems. By many accounts, the gaps are widening. Now, Brockton is exploring a lawsuit against the state — challenging the funding system — and is lining up other school districts to join it. Worcester, another struggling city, decided last month to jump in. 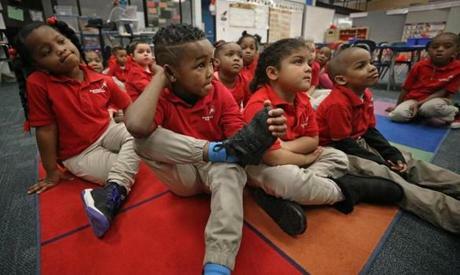 Brockton and Worcester school leaders view the funding inequities as a civil rights issue, depriving their students, who are largely poor, minority, and immigrants, the right to an equal education. The chief culprit, they argue, is the state’s formula for doling out aid, which favors poorer districts but has failed, by a wide margin, to keep pace with the actual cost of providing a public education. Real estate taxes fund most of the rest of school spending, a fact that further locks in inequality of opportunity. Wealthy communities have an obvious, systemic advantage; they can make up the difference and then some, while others, like Brockton, are barely scraping by. A legislative commission highlighted this divide 2½ years ago and implored lawmakers to update the state formula to reflect the true cost of an education. But the new legislation, which would likely require the state to spend hundreds of millions of additional dollars, has moved slowly on Beacon Hill. 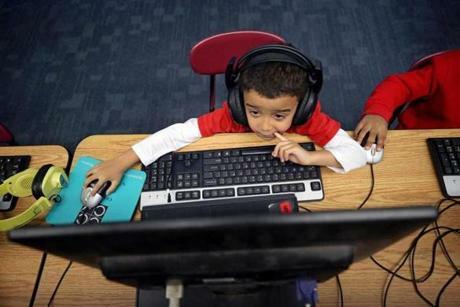 Kindergarten student Javani Centeio participated in a computer library class. Superintendent Smith, who began as a teacher in Brockton four decades ago, said she never thought she would see the return of the days when Brockton had 38 students in a class, not enough desks, and not enough books. She said she spent much of last summer fretting about how deeply she would need to cut. State data reveal huge gulfs in the wealth of the state’s school systems. In Brockton, household income on a per-pupil basis is $95,000. Yet 30 miles away in Weston, it is $1.5 million per student. Brockton’s equalized property valuation on a per-pupil basis is $309,000; in Weston, $2.6 million. Overall, Brockton spent $14,778 per student, while Weston spent $24,458. Seventy percent of Brockton’s students are economically disadvantaged, lack English fluency, or have disabilities, which means they cost more to educate because they often require specialized programs or extra tutoring. In Weston only 24 percent of students fall into one of those categories, and yet the town spends vastly more on its schools — because it wants to and can. By contrast, Brockton relies heavily on state aid, which covers 80 percent of its overall spending on education — $213.6 million — including the cost for local students attending independent charter schools. Paul Reville, an education secretary under former governor Deval Patrick, said Brockton and Worcester have a compelling case against the state. Brendan Moss, a spokesman for Governor Charlie Baker, defended state spending on education, saying the governor’s budget proposal for next year includes the highest spending amount ever on K-12 education. If approved by the Legislature, local education aid would reach $4.85 billion, a 2 percent increase over this year, representing an extra $104 million, according to a state education department memo. But the increases Baker is proposing will likely make only a dent. For instance, Brockton’s spending on employee benefits and other “fixed charges” during the 2016-17 school year was $43.6 million — about $25 million more than the state formula estimated the costs would be, according to an analysis by the Massachusetts Association of School Committees. Kindergarten student Leonel Monteiro crossed his legs in teacher Amy Mazzola's class and listened to readings. The result is that Brockton has struggled increasingly in recent years to provide the basics for its 17,000 students, as spending on the schools has grown only incrementally, failing to keep up with inflation. School officials cut over 150 positions over the past three years and have fallen behind on buying new computers at a time when the state is moving standardized tests online. Cuts are evident across its two dozen schools. At Raymond Elementary School, where a blue and white “Save Our Schools” sign hangs in the window, classes have as many as 30 students in kindergarten and around 35 in some upper grades, including those where native speakers of Cape Verdean Creole are learning English. One kindergarten teacher, Kristen Crugnale, bought six iPads with her own money for her 30 students to make up for a shortage of classroom computers, but, like many teachers, she is feeling overwhelmed at times by the class sizes. Melynda Pilling, a fifth-grade teacher, said she, too, feels stretched thin. She has 35 students in one class who don’t speak English fluently, including 11 recent immigrants, and gets assistance only part of the day from a teacher’s aide. “I was just working with students who don’t know letters and letter sounds and others who are almost at grade level,” Pilling said recently, as her students headed across the hall for a math class. Across the street at North Middle School, three dozen students in a science class sat elbow to elbow along five tables that stretch almost from one wall to the other. Budget cuts have threatened progress and undercut morale in a school system that for years has defied the odds of working with the most challenging student populations in public education. 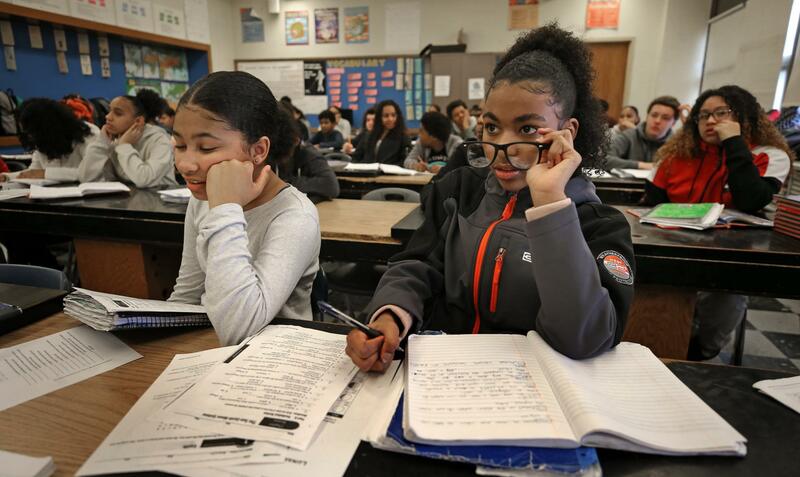 Its high school has garnered national attention as a rare turnaround success for an urban district. It didn’t come easy. Brockton High, the largest in the state with 4,200 students, initially had abysmal scores when the MCAS premiered in the late 1990s but eventually made big gains by focusing on writing, critical thinking, and other literacy skills. The relentless budget squeeze has jeopardized that, officials said. While the high school’s MCAS scores have held fairly steady in English and science, they have fallen by five points in math over the past four years, state data shows. The four-year graduation rate last year also slipped slightly to 87.2 percent, a rare decrease. “I think students, family, and teachers always rise to the occasion to do more with less, but at some point we are going to reach a breaking point,” said Clifford Murray, the high school principal. The high school has scrapped many electives or restricted enrollment in them, including foreign languages. The school also doesn’t have enough money for substitute teachers. Morgan Finnegan, 17, a senior, estimated that her classes have been sent to the cafeteria 10 times because of teacher absences. “Sometimes it’s aggravating because I’ve done my homework and they don’t give you an assignment,” she said. Brockton has long fought for equitable school funding. It sued the state in 1978, arguing an overreliance on local property taxes to finance public schools was inherently unfair. Budget cuts have hit Brockton hard. 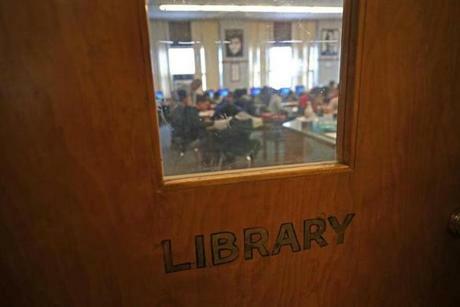 A former library at North Middle School is used as a crowded classroom. Fifteen years later, the plaintiffs finally prevailed. The state Supreme Judicial Court determined the state wasn’t meeting its constitutional duty of providing an adequate public education to all children. At the time, affluent districts were spending three times more per student than the poorest ones. The court ordered lawmakers to fix the spending disparities, an effort that was already underway. The ruling came shortly before Governor William Weld signed the 1993 Education Reform Act, which included a new funding formula. That new funding formula initially shrank the spending gaps by dramatic margins. In 1993, communities with the lowest per capita income spent about $1,400 less per pupil than towns with the highest incomes, but within seven years that gap narrowed to $370 per student, according to a report by the state education department in 2013. But the gaps now appear to be widening. Several school systems that have among the highest income levels in the state, such as Weston, Lexington, Concord, Carlisle, and Wellesley, spent more than $18,000 per student, while several urban districts with low income levels, such as Brockton, Fall River, New Bedford, and Lynn, spent below $15,000 per student, according to state data for the 2015-16 school year. The funding formula, known as the foundation budget, is supposed to promote equity by attempting to calculate the cost of an adequate education in each school system based on the students they serve. The formula then aims to account for a community’s ability to pay. Under the formula, the state doles out more aid on a per-pupil basis for those students who typically cost more to educate, such as those with disabilities or language barriers. As a result, Brockton received about $9,600 per student in state aid during the 2016-17 school year, compared to only $1,500 in Weston, according to state figures. But the formula has failed to keep pace with escalating costs, according to a report by the legislative commission. While the report did not include a price tag, another study in 2011 by the Massachusetts Budget and Policy Center, a left-learning think tank, found the foundation budget calculations were off by more than $2 billion. Smith said problems run deeper than the foundation budget. The state has been shortchanging reimbursements paid to school districts when their students attend independently run charter schools or pricey out-of-district special education programs. The state also changed how it counts low-income students, causing some districts to receive significantly less aid. Brockton’s possible litigation might not be necessary, though, if lawmakers take action. Legislation to update the state funding formula and pump more aid into the public schools, especially the neediest ones, has the support of nearly every state senator — though it faces a less certain future in the House and Baker has not indicated if he supports it.